Take home the thrill of the World Cup with the 10ft x 6ft Pro Football Goal! This professional style goal is perfect for kids. Exclusive to Smyths Toys Superstores, this sturdy football goal has a flexible white frame with screw-fix joints for extra durability. The freestanding 10ft x 6ft Pro Football Goal is ideal for kickabouts, matches, and practicing your football skills in the back garden. The pole lengths that make up the 10ft x 6ft Pro Football Goal are easy to assemble, and can be disassembled for more convenient storage, so you can quickly convert your garden from football pitch to lawn and back again, without the need for any tools. 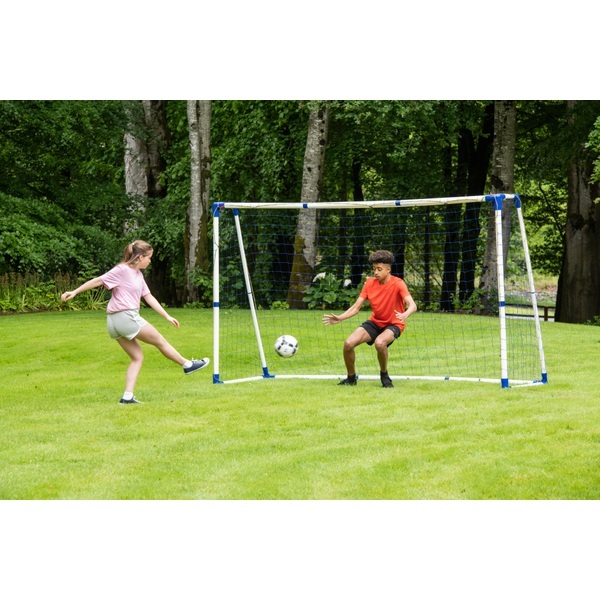 The 10ft x 6ft Pro Football Goal is perfect for getting the kids playing outdoors. Football and other team sports are great for developing competitiveness and teamwork while staying active and social. The ABS material and plastic poles of the 10ft x 6ft Pro Football Goal are designed for durability and portability, so your kids can enjoy year of versatile outdoor fun. The pictured ball is not included with the 10ft x 6ft Pro Football Goal.